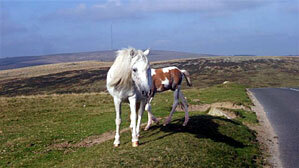 The Golden Hind apartment is available for a minimuum of 2 night stay. Bookings are now handled via Air B&B. To send an enquiry about availability or make a provisional booking, please fill out the form below and someone will get back to you as soon as possible. 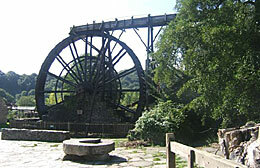 Alternatively, please telephone or fax 01822 853892. 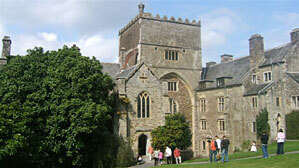 The historic home of Sir Francis Drake, Buckland Abbey, is within walking distance from Buckland Monachorum. Throughout the year the house, gardens and integral art and craft workshops are open and host a variety of events. 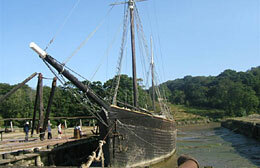 Drake spent more time ashore here than at any other place in his life and artefacts from his life are on show throughout. From Buckland Monachorum, you can stroll across the meadows to the nearby Garden House at Crapstone and appreciate being closer to Gods heart... Enjoy a cream tea or home-made cakes and pastries in the tea-rooms of this exquisite tribute to mans' gentle taming of nature. The staff of the adjoining Garden Centre are happy to dispense knowledgeable advice with the purchase of Garden House raised shrubs and perennials. Plymouth - with the shopping, theatre and nightlife to be expected of a major city - is about half an hours journey by car; explore the Barbican and fabulous Marina, stand on Plymouth Hoe and picture the Spanish Armada entering the Sound. On the other hand, the historic stannary town of Tavistock, with it's award wining Farmers Market and delightful array of independent shops and boutiques, is even closer. With the covered Market open every day, local tennis courts and Wharf Arts Centre, housing contemporary cinema, live music and art themed events, Tavistock offers a genuine choice of activities to suit every taste. Just a short drive to the glorious South Hams, provides you with interesting small towns, and fabulous beaches alongside award winning restaurants and interesting shopping opportunities. About an hour away, South West of Plymouth, are the beautiful beaches and enchanting harbour villages of Whitsand Bay, Polperro, Looe and Fowey, while, slightly further afield, on the North Coast of Cornwall lie Padstow, Tintagel and Bude - all within easy reach on a days excursion. The legendary Lost Gardens of Heligan, in Pentewan, Nr. Mevagissey and the Eden Project, with it's surreal and iconic biomes, near St Austell are a 'Must Do' and can be reached within an hour and a half via the A38/A30. The Drake Manor Inn at Buckland Monachorum was originally built to house the skilled workers constructing St. Andrews church in the 12th century. Thereafter it was, among other purposes, used as a Maltings - where Barley or other grain was steeped and prepared for brewing and distilling. 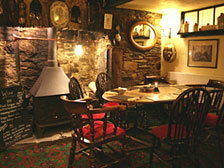 However it has always been a hostelry, welcoming travellers and visitors ever since. The brook that bubbles beside the Inn was, for centuries, the main water source and villagers would haul buckets home to fill the ten gallon coppers that boiled the water for the weekly tin baths and unimaginable labour of Monday washday. The granite steps are still there but now a garden lies beside the brook, along a narrow path leading behind the Inn; a tranquil and pretty space with bowers of roses and brightly planted borders. 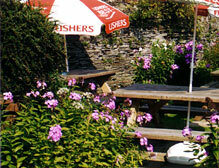 Over the centuries the Inn established itself at the heart of the village and that is no less true today. St Andrews school is thriving and the Church strongly supported, but you'll meet, should you wish, villagers in the public bar that remember the days of several stores, of a village baker and butcher, of the annual flower show and the summer tea party when the village children would march behind the band. Somehow, despite the changes, that atmosphere remains; the people that call Buckland Monachorum 'home' and use the Inn as a social meeting point may, today, be professionals from Derriford hospital, IT specialists, a famous musician or renowned painter, or could be the man that knows the secret to ensuring the survival of an orphaned lamb or how to grow the best runner beans, but you'll find them pretty indistinguishable, standing side by side in the public bar. The cosy rooms beneath ancient beams still ring with laughter and debate, hands are rubbed before woodburning stoves and tales recounted. 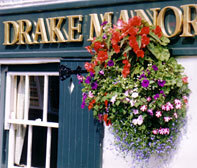 The Drake Manor, under the stewardship of proprietor Mandy and her competent, smiling team, is rightly renowned for it's friendly atmosphere and good food - during the summer and most weekends, booking for the restaurant is strongly advised! The menu - prepared to order from locally sourced, seasonal produce is complemented by the Specials board - updated regularly and thoughtfully developed by Mandy and Steve to reflect the very best of local availability. Imaginative starters, fresh bread, delicious desserts - it's all available in either the Restaurant, bar or garden, as you wish. The wine list is frequently reviewed, the real Ales tried and tested for flavour and quality, the bar stocked with beverages to suit every palate and inclination. 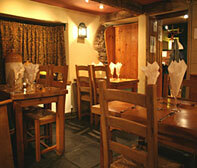 The Inn is open seven days a week and food served daily, lunchtimes and evenings. 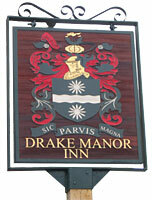 For opening times, menu, wine and whisky lists along with more photographs, see the Drake Manor Inn website. The Golden Hind Apartment retains features from a building that dates back to the 12th century, with exposed oak roof timbers and vaulted ceilings throughout, creating a delightfully bright and airy space above the Drake Manor Inn and Restaurant. Spacious enough to comfortably accommodate 4 people, full soundproofing ensures peace and the luxurious furnishings and accessories reflect proprietor Mandys' customary attention to detail. The Golden Hind Apartment is accessed from the ground floor via the original narrow, winding internal staircase. From here you enter the open plan living area - a fully equipped kitchen, with washer/dryer , fridge, stove, microwave and a comprehensive array of cooking equipment, leading into the dining area and stylish lounge. For your pleasure and enjoyment, free broadband internet access, 32" flat screen digital TV, radio, CD and DVD player, plus a selection of CD's and DVD's, are supplied. The accommodation further encompasses two double bedrooms - with a choice of Super King or Twin beds in the first bedroom. The bathroom, newly installed, holds a large bath with fixed overhead shower, lavatory and washbasin. Plenty of storage space for toiletries and cosmetics, with good mirrors and strategic lighting, complete a decadent oasis for relaxation and preparation for the evening ahead. Rich chocolate Amitico flooring through the living area is complemented by soft beige carpets in the bedrooms; fresh flowers, sleek wooden slatted binds and dreamy voiles at the windows add to the luxurious, relaxed atmosphere.